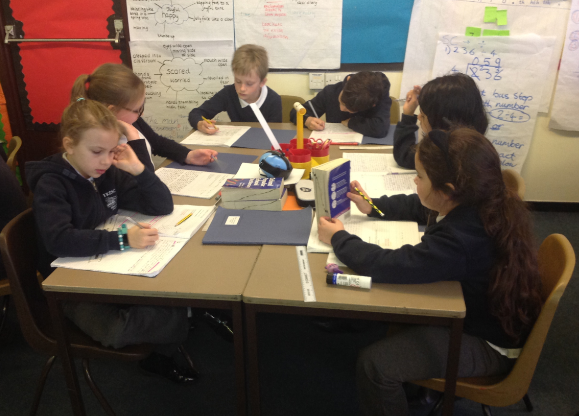 Phoenix class have continued to be busy, busy, busy this term. In English we have been looking at the story of Cinderella and writing our own versions. Some of these included Cinderella slipping over at the ball, not making it to the ball or even the Prince choosing the ugly step sisters over Cinderella! We have also looked at internet safety this term and what we can do to stay safe when using the internet. This included keeping passwords safe, checking sources to make sure they are safe and reliable and not handing out personal details. Also this term we have been fortunate enough to have Sam from Bristol Rovers come in and work with us on Friday afternoons. These sessions include learning about our bodies and how to stay healthy before going outside to complete a practical sporting activity. This term has also seen us start our Djembe drumming sessions. On Tuesday afternoons we have our session where we are learning about different rhythms and notes and how to put them together to create Djembe beats! The staff at Frenchay Primary have been learning some new skills in preparation for two themed weeks in term 3 and term 5. Everyone was taught how to use silk paints, shown how to create stencils for screen printing and make a printing block for relief printing. It was great to see everyone finding their create flair and working together to solve problems that occurred, great skills that the children will also develop when it’s their turn. This term we shall be holding an art themed week, based on a famous artist and during the Design Technology week in May, the children shall be designing and making a bag for a friend or relative. We hope the children enjoy it as much as we did! The children in Unicorn class have had a fantastic time during Term 2. They have explored bonfire night and have learnt that some people also celebrate Diwali. The children made some colourful firework pictures and made their own Diva lamps to celebrate Diwali. The children enjoyed taking part in different Pudsey activities for Children in Need, where they made their own Pudsey masks. They also worked hard to prepare for their Nativity which was a huge success. Well done to all involved. The children couldn’t wait to perform their show! entrance when you visit the school. 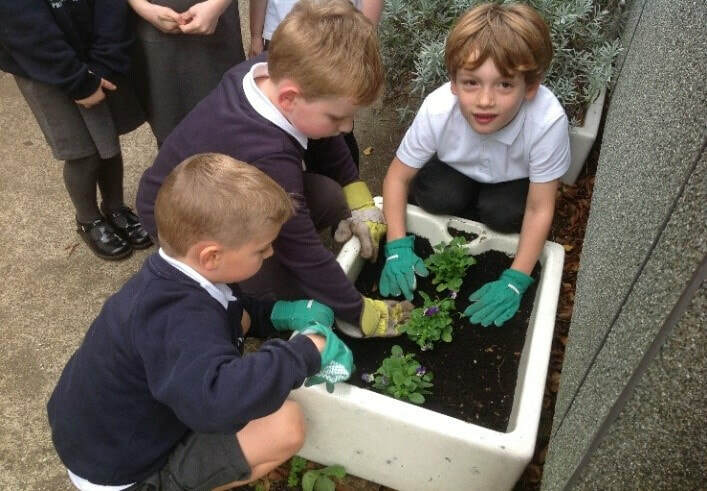 Gardening Club has now come to a close for the winter. We plan to restart in the Spring Term when the weather is a little warmer so we can grow some vegetables as well as flowers. The children have begun their learning in each of their topics with various trips. Those in Gruffalo class are looking forward to visiting Berkeley Castle as part of their castles topic and Unicorn class have also been out to the forest area. Dragon class began their topic of the Second World War with a fantastic trip to the Swindon Steam Museum. They enjoyed dressing up and taking part in various workshops. They experienced a bomb shelter, an evacuee train, a steam train used to transport weapons, toys from the 1930s and 40s and heard from people who experienced life during the war. It was a memorable experience for us all. The children learnt a huge amount and had a lot of fun. As part of the learning in music, Dragon class have also been enjoying their weekly ukulele lessons with Mr Davies. They are learning some fun tunes and songs and there are even some budding George Formbys in the making! We have started the new academic year with lots of fun at Frenchay Primary School. 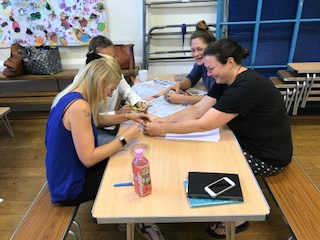 Staff had an INSET day where they got to know each other through some teams building activities which can be used with the children. The first was to defend the egg, by making a carrier for it to be launched from a height, the teams had to protect it from being smashed with limited resources. Then they had to make the tallest tower from spaghetti! It was a great way to meet and work with our new colleagues. The activities brought out everyone’s competitive side! All the parents and carers were invited for tea at the start of term. We were overwhelmed at the number who joined us. It was lovely to catch up with so many after the summer break. On Friday 29th June 2018 Frenchay Primary School held a day of celebrations to mark its 175th anniversary. The events included a new flag for the school and huge birthday picnic featuring the Bristol Veterans' Brass Band playing some well known celebration songs. We even had a special birthday cupcake each! In the afternoon, there was a wonderful service of celebration in the church. Lots of people spoke about why education was important to them and Griffin class told the history of the school. We were even joined by 2 previous headteachers - Mrs Allen and Mrs Thorne - who read the school prayer out with Mrs Marks. The Renewal Gospel Choir were amazing with their singing. Charlotte, 8, said "it was a lovely day and a great way to meet people from across the school." Bethan, 8, commented that it was a lovely service and that she was very pleased to have taken part. We think that it was a great way to say happy 175th birthday to our lovely school! Each term at Frenchay Primary seems to be filled with so many fun and exciting events and learning opportunities. We have welcomed Revd Charles and theological student Andy into school to lead worship, based on our new value, respect. We are looking forward to watching a performance in the Frenchay Church of the feeding of the five thousand. A whole school trip to We are the Curious (formerly @Bristol) is rapidly approaching so we can all experiment and develop our scientific understanding. Gruffalo class have had a brilliant visit to the SS Great Britain and following this each child wrote a letter to Isambard Kingdom Brunel pretending to be a passenger at the time. Here is Lucy's letter. I am writing to say thank you because I love the way that the propeller was made so that the ship goes fast. I was very impressed with the shiny, glittery, gold decoration that was so beautiful to look at. On the weather deck I found a giant brass bell that was so loud I could hear it all over the ship. The masts were so tall and long. I couldn't believe it. To look at the top of them, when the sailors were climbing the mast it made me so scared. I enjoyed your amazing ship. Thank you. The current Frenchay Primary school opened its doors in September 1842 (it was founded in a different building, also in the heart of the village, in 1829) and so this academic year we are celebrating 175 years of schooling in our wonderful Grade II listed Victorian school building. Despite many alterations inside, and some additions in the school grounds, much of the daily life of our school still takes place in much the same surroundings as it did 175 years ago. Worship and lunchtime are still in the original school hall, the youngest children learn in what would always have been one of the classrooms and of course the whole school still enjoys using the Frenchay Common for sports and games and has close links to the village community. To mark our 175th anniversary, we are planning some celebrations for this summer. On June 29th at 2pm we will be holding a special multi faith service of thanksgiving in St John's church, to which all members of the community are of course invited, especially those with current or past links to the school. We will be welcoming past members of staff and pupils, as well as some special visitors to help us celebrate, including the Bishop of Swindon, representatives from different faiths, our local MP Jack Lopresti and the deputy Lord Lieutenant of Gloucestershire. Our local bell ringers will hopefully also be on hand to give thanks for our school with a 45 minute 'anniversary doubles' peal. As this date coincides with the school's PTA summer barbecue, it is hoped (British summer weather permitting) to continue the celebrations on Frenchay Common after the service; more details to follow soon. We are also planning to hold an exhibition in the village museum in the weeks leading up to the service. Please keep an eye on our Facebook page and school website for more information nearer the time. If you have any information about the history of the school, or if you have any interesting stories about your time here, please email chris.strawson@frenchayprimary.org.uk and we will do our best to incorporate them in to our celebrations. Recently I was thrilled to be approached by two conscientious girls who have a keen interest in writing articles as journalists. I set them a task to write an article for the Frenchay Community News. They have worked very hard to gather quotes from other children and put together information about our new lunchtime routine. I hope you enjoy reading their finished article. Well done girls, a really great job. I would love to have more children write parts of our newsletter or contribute to the FCN, so hopefully there will be more articles from the children to follow. The new lunchtime routines have improved lunchtimes as it makes it more enjoyable because there is lots of new equipment. Blossom Land is a place to create obstacles and games from tyres and wooden planks. It is a place for adventure and to tire yourself out at lunchtime. Leafy Garden is a quiet time and a place for chatting with friends. There are comfy car seats to sit on and lots of dressing up outfits to play with. "There's a bigger range of people to play with now. My favourite piece of equipment is the car seats because they rock backwards and forwards." "I like doing gymnastics on the mats with my friends." Jumble Land is a place where you can create dens, places to hide and bounce around on hoppers. "Jumble Land - I love the new equipment. I like playing with my friends. " Fun Land is a very sporty place. There is football, dodgeball and various other sports going on each day. There is also a section where you can play hula hoops and bounce on bouncy hoppers. "I like the bouncy hoppers because I always want to play on them with Nula." "I like the obstacle course. I like standing on the wooden planks." 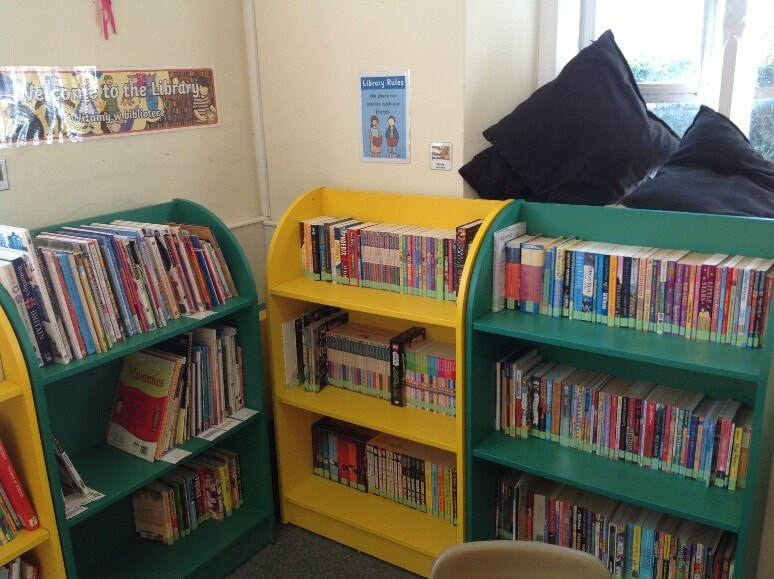 There was excitement at Frenchay Church of England Primary School last Friday as pupils celebrated the opening of their newly refurbished library. World-renowned and award-winning children’s author, Joanna Nadin, who has published over 70 books, was the guest of honour. She ran an assembly for the whole school to talk about how she writes her stories and answered questions from the children. She then cut the ribbon to officially open the new library. The school PTA have been working tirelessly to fund a huge variety of new books for the revamped room. The Head Teacher, Mrs Marks, has even painted a mural on the wall, which was chosen from children’s designs. The event was organised by the Year 5/6 teacher and English leader, Helen Shepherd, who said, ‘Joanna was brilliant. She really inspired the children by talking about how she gets her ideas for stories. The children are so enthusiastic about reading and are excited to be able to borrow from a wide range of brand new books. I want to say thank you to Joanna and everyone else who has worked so hard to help us’. The occasion was also marked by an own clothes day and there was even a book-inspired cake, made by a parent, Rachael Mather. At Frenchay Primary we have had another exciting term. The children in Unicorn Class are continuing to enjoy their first year in Primary school. In January they completed a project about toys and invited their own favourite toys in to school. They practised baking in their mud kitchen and then they baked real scones and shortbread for their teddies and held a picnic in their classroom. They helped them to eat the picnic. Then they began a project on dinosaurs and are now dinosaur experts. They have read about dinosaurs, drawn dinosaurs, made dinosaurs, written facts and stories about dinosaurs, sung songs about dinosaurs and counted dinosaurs. 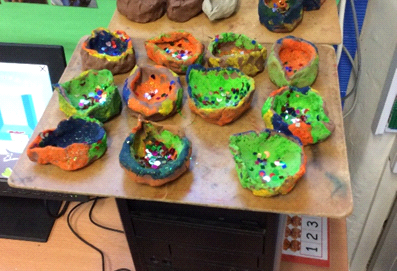 They made dinosaur eggs, dinosaur footprints and they went on a forest walk to hunt for fossils and then used the stones that they found to create their own dinosaur. To end their project Freya’s granddad, who is a palaeontologist, brought a T-Rex brain and tooth in to school. It was amazing! Did you know that a T-Rex brain is the same size as a T-Rex tooth? We are also really excited about the prospect of our new school in September 2020. It was lovely to meet so many of you at the drop-in session at the Village Hall. There is much work to be done but the opportunities that will become available to the children of Frenchay will be well worth it. At Frenchay Primary School we are planning changes to our lunchtimes. The staff and children are working hard to plan a range of activities and resources that will encourage creative and imaginative play as well as those activities that will develop sporting and social skills. We are looking for any contributions of items such as guttering, tubing, large reels, milk crates, tyres, planks, etc. that can be used by the children. If you have anything to donate, please contact the school office via the school email address: office@frenchayprimary.org.uk. Firstly the Frenchay Primary children, staff and parents would like to say Happy New Year to you all. We are looking forward to many exciting times in 2018 here at Frenchay Primary. It was no surprise that last term was busy with the PTA Christmas fair, film night, two Advent services with St Johns Church. Our Nativity was a very special occasion and I was very proud to see all our KS1 and Reception children getting into the festive spirit and performing so well. On the first Sunday in December I was proud to be commissioned into the Church as the new Head teacher. It was a very special occasion which I was lucky enough to share with my family, friends, colleagues, governors, parents and members of the community. The singing by the choir was beautiful. We also took part in our first football tournament of the season at the end of November. The football team played at Bromley Heath Junior school. All of the children did themselves and the school very proud indeed. The team were unlucky in the first game, losing to 2 late goals from Bromley Heath's A team. In the second game, they played with determination and perseverance but were beaten by a very strong team from Staple Hill, who won all 3 of their games. However, the team's hard work paid off in their final game, against Bromley Heath B team, as they took control and scored with a beautifully crafted team effort, finished in style by Ethan. A fine save from Thomas at the very end of the game ensured Frenchay won 1-0. The 2 teams from Bromley Heath drew in their last game, which meant that Frenchay ended the mini tournament with 3 points from 3 games, and finished second overall. What a fantastic effort from the team - well done too you all! The term has begun in full swing at Frenchay Primary School. On Monday we gathered for worship to celebrate the strength of our community, not only as a school but our place in the village as a whole. Each of us selected a pebble which is a symbol of each individual, all adults and children. These pebbles were placed into our ‘community’ or ‘Koinonia’ bowl which is now on display in our reception area. The meaning of this word is taken from the original Greek word means ‘fellowship’ or ‘community’ and emphasises the importance of this concept within the Christian faith and expresses the quality of the relationships we share. We are all members of the same family, God’s family. As someone new joins our community, a pebble is added. Those who leave, take their pebble with them to remind them of the fellowship they have shared and the special partnership they have enjoyed. As a school we celebrated Harvest on Friday with our parents and members of the Frenchay community. The service was led by Griffin class who shared lots of information about the meaning of Harvest and its importance. We learnt how many miles some of our food travels before it makes it to our plates, including where some ingredients are grown before being flown to the UK. It was lovely to see so many parents and members of the community there to join us for our service. All donations of food were gratefully received and are being shared with a good cause. We are incredibly proud to be celebrating our 175th Anniversary this year and plans are being drawn up to celebrate in style in the summer. More information to follow. The children are very much looking forward to a new academic year at Frenchay C of E Primary School. Term started on Monday and everyone is settling back into the runtine after the long summer break. As a new headteacher to Frenchay it is a pleasure to see such wonderful and enthusiastic learners. The welcome I have received from parents, staff and children has been fantastic. I am very much looking forward to working with you all over the coming years, ensuring that Frenchay C of E Primary remains an important part of local community. If you have any suggestions of ways we can support each other please contact the school office. At Frenchay we are proud of our achievements in and outside of school. A group of children in KS2 worked with Mr. Strawson to enter the Jaguar Car challenge. The children had a fantastic time learning about Science, Technology, Engineering and Maths, as well as meeting children from local schools and of course racing their cars. This event was sponsored by local industries such as Rolls Royce, MK Financial and Concept Gemini. All of our children have many enrichment activities planned before the end of the summer term with visits to Folly Farm, At Bristol as well as a summer production led by our Year 6 children. At the end of the summer term I will be retiring from my post as Head Teacher. I have been privileged to be the Head Teacher for the past 11 years and I will leave with fond memories of my time here. In those years I have seen the school progress to a consistently good school with many outstanding features. I feel this is the right time to hand over the reins to a new leader. Before the Easter break the governors of the school appointed Mrs Katherine Marks as Head Teacher from the 1st September, 2017. Mrs Marks will join the school with vast and varied experience most recently as an Assistant Head Teacher from a Church of England Primary School. I leave the school in good hands as she recognises the real strengths of our school and shows an inherent enthusiasm and commitment to build on our successes and to continue the school’s journey. Griffin class have been invaded! On the 8th March Griffin class (Years 2 and 3) were invaded by King Hrothgar from the local Saxon tribe. Hrothgar spent the day teaching Griffin class about life as an Anglo-Saxon king including what it was like to be a warrior (with real swords, spears and even a slingshot), fire lighting and storytelling. The class re-enacted the famous Saxon saga of the brave warrior Beowulf and his defeat of the hideous monster Grendl (expertly played by Mr Strawson) and Grendl’s mother (even more expertly played by Mrs Carr). In the afternoon, they found out about the untimely end of Beowulf at the hands of a vicious dragon and learned about Saxon funeral rituals. The Griffins also learned how to play the ancient Norse game Hnefatafl (a bit like a cross between chess and draughts, but totally different really!) which taught them a lot about teamwork and strategies. All in all, the class had a fantastic day and took away many great memories and new facts about the Anglo-Saxons. 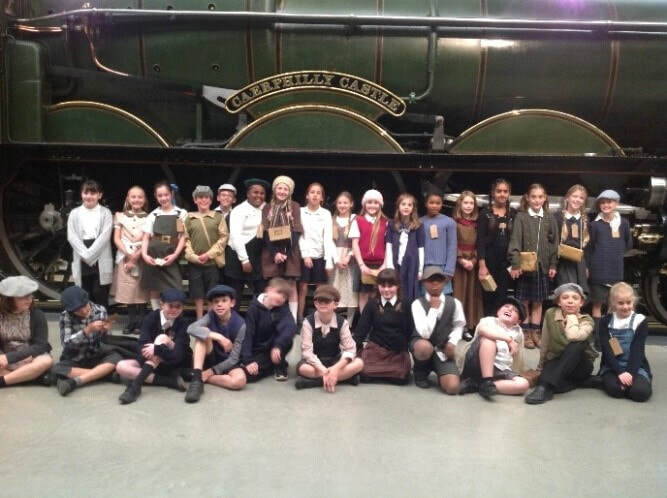 On Thursday 6th October, children from Dragon class (class 5) at Frenchay Primary School visited Swindon Steam Railway Museum as part of their topic on the Second World War. Pupils from year 5 and 6 came dressed in clothes from that era, most choosing to be evacuees; some even had name labels around their necks and carried gas masks. Swindon Steam Museum holds World War II discovery sessions and children got to experience how it would have felt to have been in an air raid shelter. They carried out role plays as members of a family during the war, got to sit on a steam locomotive which was used for transporting soldiers and artillery and had some time to explore the museum. The best part for many though was the ‘Evacuee Experience’. Children could really see what it would have been like to leave their families and be evacuated on a train to the countryside and be selected by members of the public to be looked after during the war. The volunteer staff were excellent and played the roles of Air Raid Patrol Officer and Evacuation Officers brilliantly. Looking back at last academic year at Frenchay CE Primary School, we had a great year. Ofsted visited in September 2015 rating the school as consistently good. The Statutory Inspection of Anglican and Methodist Schools Report (SIAM) that judges the school effectiveness as a church school, took place in June 2016. The school was rated overall good with one out of the three areas judged as outstanding. The school also was awarded its Bronze School Games Award. This has been accomplished by the dedicated commitment of all staff, pupils and parents working together. The children engaged in lots of sporting events as after school clubs and competitive events with our local schools. Well done to all the children who competed. accomplishments. 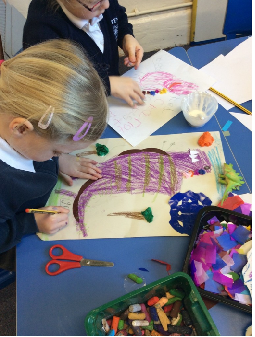 Our June writing week theme of Habitats, began with a whole school trip to the zoo and each classroom taking on a different creative habitat theme. The following day we had a visiting author who inspired the children to write. The week concluded with a writer’s café where children shared their writing with other children of different ages. Reception class teacher and Mrs Brown a Teaching Assistant. Their retirement was celebrated with a whole school lunchtime party and an entertainer in the afternoon one day and a goodbye assembly on the last day of term. They will be missed greatly. Looking forward, September is an exciting month for us as we welcome our new Reception children and families into the school community and embark on some stimulating theme learning with our new teacher, Mrs Hulm. Our two lower school classes will be beginning themes on Kings and Queens and Landmarks with our two oldest classes studying Vicious Vikings and World at War with an emphasis on WWII. Already we have a planned visit to the Steam Museum in Swindon where the children will engage in a World War II experience. September 2017, please look on our website for dates for visits to the school. Please contact Mrs Downes, School Administrator, on 01454-868181 if you would like to book a visit on any of these days or to arrange an alternative date. Occasionally due to families moving out of the area, we have spaces in other year groups, so please contact us on the above number if you are interested. Frenchay School prides itself with not only high educational standards but giving each child a broad and balanced curriculum so each child recognised their own abilities. The jazz music was really exciting. They talked about different instruments and one showed how you dance to jazz music. It was really fun and I hope they will come again. There was a double bass, drums, trumpet, a keyboard, a singer and a dancer. Our choir will be singing at the Colston Hall again in June and on Sunday 7th June you will have the opportunity to hear them sing at Afternoon Tea in the church. Our musicians will be joining the choir to show their talents in playing a variety of musical instruments. Please join us! At Frenchay, children are encouraged to live a healthy lifestyle and sport plays an important part. The children have the opportunity to work with a sport coach as part of the curriculum and enrichment activities after school. We have strong links with Frenchay Cricket club and each summer term they come to work with our Year 4, 5 and 6 children during a PE session and offer an after school club. Many of our girls have excelled and have gone on to play for Gloucester cricket club. We are so proud of our children’s achievements! Looking ahead to the end of the summer term we still have lots of exciting learning opportunities for the children over the next few months linked to our themed learning. Our reception children will continue to regularly use Vassalls Park to develop their forest skills and other classes as part of their Science curriculum. Staff are busy planning WOW moments for our final themed activities for each class to bring learning alive. End of term activities would not be complete without our summer production. This year the children will be performing ‘Pirates of the Curry Bean’ week commencing 6th July in the church. Everyone welcome!! If you would like to be part of our school community and have any spare time we have a vacancy for a school crossing patrol on Wednesday mornings, 8.00 – 9.00 am, term time only and to cover occasional holiday. Training and uniform provided. Rate of pay is £7.65 per hour. Please contact Wendy Feltham on 01454 863611 or at wendy.feltham@southglos.gov.uk for an informal discussion and application form.